The Walk: The walk starts from New Radnor and follows a path heading west to Harley Gorse from where it changes direction and heads north following Harley Dingle upstream. Follow the watercourse for a short distance to a ford crossing which is taken before heading north north-west on a path up the east flank of Fron Hill. Follow the path towards Davy Morgan's Dingle which is crossed before turning right from the track onto a track which initially heads due north and then curves eastwards to reach the summit plateau of Great Rhos. 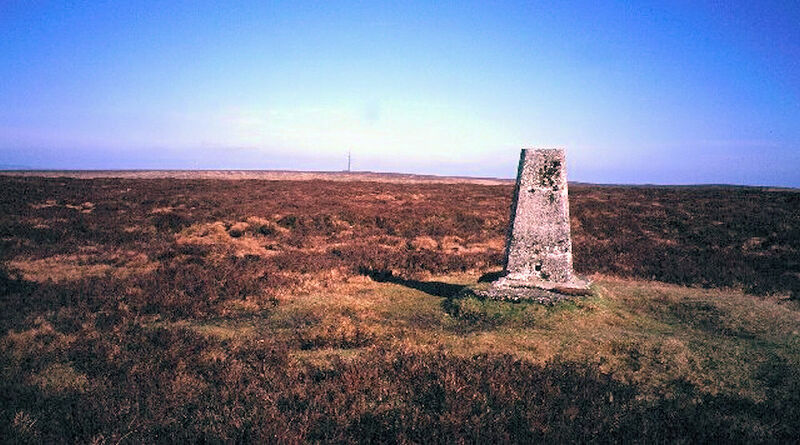 Look for the trig pillar which is north of the track and make your way to claim the county top before heading back to the track. Stay on the track heading south to reach the point from where you came originally. Then retrace your steps home. IMPORTANT: DO NOT STRAY FROM THE TRACK AT ANY TIMES AS THERE IS THE PRIVATELY OWNED RADNOR AMMUNITIONS FIRING RANGE JUST BEYOND THE EAST EDGES OF GREAT RHOS AND FRON HILL. WARNING SIGNS ARE PLACED BESIDE THE ROUTE. The Walk I Would Do: I would do the walk as described from New Radnor though heading to Great Rhos on paths from the west such as the paths from near Llandegley would keep you well clear of the danger areas within Radnor Range.